The original, developed by Interplay, was enough of a hit to spawn a sequel in 1991 and a remake that debuted on Steam in 2014, and today Brian Fargo revealed that he'd started work on a second sequel in the late 90s that ultimately never saw the light of day. 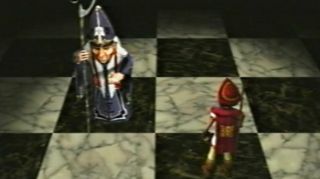 Fargo co-founded Interplay in the early 80s, and while he's probably best-known as an RPG guy, he was the producer on the original Battle Chess. The fight in the video is clearly too drawn out to be of practical use in the game (I can't imagine sitting through a full one-minute combat sequence for every piece taken, anyway) but as a prototype I'm assuming that the intent was to demonstrate the principle rather than actual gameplay. The tone is certainly accurate, though: As you can see in this video of Battle Chess death animations, low blows, cheap shots, and goofy humor were par for the course in the original.